PRISONERS in the Republic of Ireland were held in solitary confinement for 22 hours a day for months and even over a year, despite UN recommendations of a 15 day limit. The figures obtained by The Detail using Freedom of Information legislation represent a sample day in January and campaigners claim it is the first time such information has been made public. 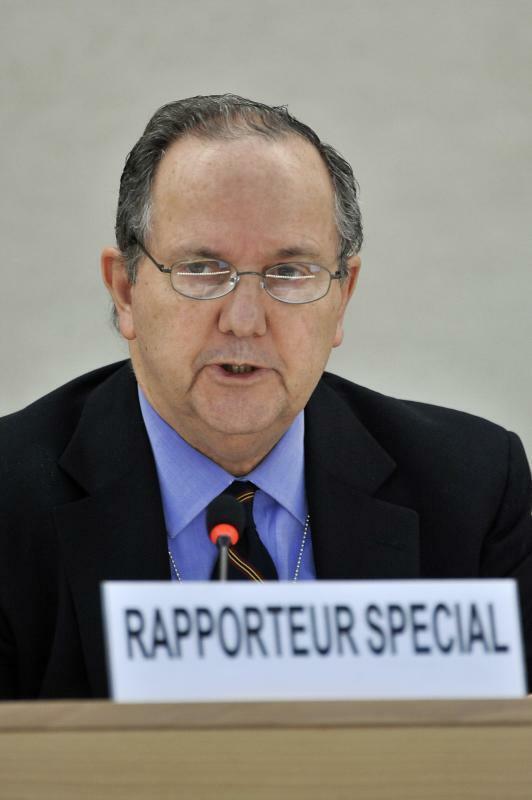 The periods of detention have been heavily criticised by United Nations Special Rapporteur on Torture Juan Mendez who has highlighted evidence of the psychological damage caused by detentions of over 15 days. Mr Mendez told The Detail: “There is no question to me that those people are suffering what constitutes cruel, inhuman and degrading treatment and perhaps depending on the gravity of their suffering - even torture. The Irish Penal Reform Trust (IPRT) has also called for a total ban on solitary confinement in all Irish prisons. Recent analysis by The Detail of procedures in Northern Ireland revealed that that prisoners in the top security Maghaberry Prison in Co Antrim were held in solitary confinement for months and years. In one case an inmate was held for five years. The figures for the republic show that on January 1 a total of 51 inmates across the various Irish Prison Service jails were being held in their cell for at least 22 hours a day, with half of them held there for over 100 days and at least nine prisoners spending over a year in such conditions. 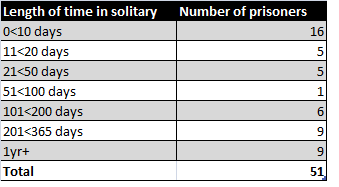 The prison data obtained through a series of Freedom of Information requests is the first time the Irish Prison Service (IPS) has publicly released information on the specific lengths of time inmates are spending in solitary confinement in the Republic of Ireland. The authorities declined a request for figures stretching across five years, as had been provided in Northern Ireland, but instead provided the data for a single day in January this year which provided a snapshot of practices in the republic. The Irish Prison Service said prisoners can be held in 22/23 hours lock-up for a number of reasons, including at their own request or for their own protection. Monthly figures from the Irish Prison Service show a decrease of 211 prisoners on 22/23 hour lock up in July 2013 to 74 prisoners in July 2016. HOW IS SOLITARY BEING USED? 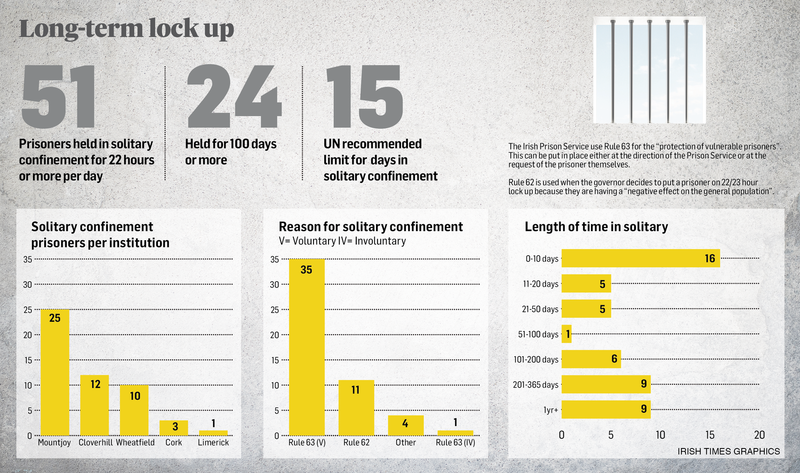 The Irish Prison Service (IPS) refers to 22/23 hour lock up as a “restricted regime”, but the United Nations considers solitary confinement as the physical isolation of individuals who are in their cells for over 22 hours a day. In July next year the UN Committee against Torture will consider how Ireland is meeting its obligations under the UN Convention Against Torture and Other Cruel, Inhuman or Degrading Treatment or Punishment. Commenting on the Irish Government’s obligation to give evidence on this matter Mr Mendez said: “Clearly the figures show Ireland has violated the emerging standard that we have established in terms of how long people should be spending in solitary confinement. In our previous story, Northern Ireland’s Prisoner Ombudsman had raised concerns that prisoners with complex mental health needs were among those being held long term in solitary confinement in Northern Ireland’s prisons. For our last report The Detail sought to compare the length of stay in solitary confinement with prisoners in the Republic of Ireland (ROI). While monthly figures from the Irish Prison Service showed a decrease on the number of prisoners going to solitary, officials previously failed to respond to our request to release information on how long prisoners were spending in solitary. The Detail originally asked the Irish Prison Service to provide information on inmates who were on 22 or 23 hour lock-up during the last five years. After a number of follow up requests, the IPS provided The Detail with information on the inmates across all of its prisons on 22/23 hour lock up as of January 1 2016. The figures show that on this day 51 inmates were being held in their cell for at least 22 hours a day in five of Ireland’s 14 prisons. Half of them had been held in solitary for over 100 days and at least nine prisoners had spent over a year in such conditions. Half of those held in 22/23 hour lock up on this day were inmates in Mountjoy Prison in north Dublin. The remaining prisons where inmates were held in these conditions included Cloverhill, Wheatfield, Cork or Limerick prison. The majority of prisoners held in solitary confinement in IPS jails on 1 January 2016 were sent there under Prison Rule 63. The Irish Prison Service said this rule is designed to protect vulnerable prisoners. It can be used at a prisoner’s own request or when the governor considers it necessary for the inmate to be kept separate from other prisoners who are reasonably likely to cause significant harm to them. Speaking to The Detail, Juan Mendez said while there were legitimate uses of solitary confinement in prisons, he stressed that they should not be for extended periods of time. He said: “For example if a prisoner is sent to solitary as a response to a very serious disciplinary breach or for their protection this is understandable. “But even in those cases the state is obligated to do it on a limited basis in terms of length of time and it is their responsibility to find some other way to deal with the problem in the long term, rather than just putting people in isolation for a prolonged period. Mr Mendez was appointed as the UN Special Rapporteur on Torture and Other Cruel, Inhuman and Degrading Treatment or Punishment in November 2010. He is due to step down from the role at the end of this month but has stressed the need for continued improvement in the area of solitary confinement. “I suggested a cut off date of 15 days for solitary because scientific literature suggests that after 15 days of such isolation the mind starts working differently, the effects on your psyche can be harmful and perhaps even permanent. When a prisoner is on 22/23 hour lock up in the Republic of Ireland the Irish Prison Service refers to it as a “restricted regime”. Mr Mendez said the title given to the practice of solitary confinement is irrelevant. “It doesn’t matter what you call it, whatever name it’s given in different countries, the international community’s standard rules say that it’s solitary confinement if it’s anywhere between 22-24 hours a day alone and without meaningful social contact with anyone else. In July 2013, the Director General of the Irish Prison Service established a group to look at measures to reduce the number of prisoners held on restricted regimes with a view to ensuring that all receive, as a minimum standard, out of cell time of three hours per day, to engage in exercise or activity. Mr Mendez welcomed this progress but said that all states have an obligation to amend their regulations so that nobody spends more than 15 days in solitary confinement. Commenting on the use of solitary confinement in prisons in both the Republic of Ireland and Northern Ireland he said: “I would encourage both governments to continue to review their practices, in fact it’s an obligation under the UN Convention Against Torture. Fíona Ní Chinnéide from the Irish Penal Reform Trust said the organisation would be publishing research next year on solutions to ending the use of solitary confinement in Ireland.